Happy Friday lovelies! As readers know The Makeup Examiner has a slight lip-gloss addiction, but TME has an even greater addiction to perfumes. You’d likely catch me sans makeup at the market, but never sans perfume. Scent transforms us and leaves a mark on our memories. For instance, you can probably remember the scent that you were wearing the first time that you laid eyes upon your boyfriend/husband or the scent that you wore when you met your summer crush. The Makeup Examiner loves scent so much that she’s endeavored to make her own from her garden flowers, for which she will share her adventure at a later date, and any opportunity that I have to play and mix scents is one that I jump on … especially when the opportunity to experiment isn’t going to cost me a lot of money. Herbal Essences launched a line of body washes in June and they compliment Herbal Essences line of shampoos and conditioners, which alone makes for a great way to have a signature scent by “layering” your favorite scent from hair-to-toe. How can you create your signature scent using the Herbal Essences line? For example, you can pair Hello Hydration Shampoo and Conditioner ($4.50 each) that is a scented combination of orchids and coconut with Hello Hydration Body Wash ($4.99) scented with warm vanilla and coconut. Two other combinations that The Makeup Examiner loves mixing are Body Envy Shampoo and Conditioner, which is a scented combination of passion flower and scented pearl (a relative of the magnolia), with Body Burst Body Wash that has the same scent combination as Body Envy. The other lovely combination is Color Me Happy Shampoo and Conditioner, scented with Moroccan rose and passion fruit nectar, paired with Happy Go Lather Body Wash that is of the same scent combination. 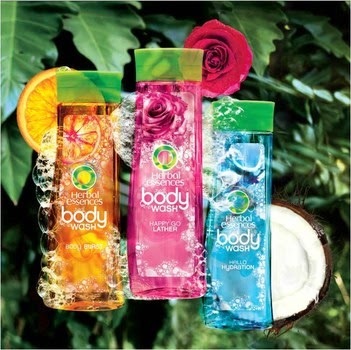 Creating a signature scent can be as easy as paring your favorite body wash with your favorite shampoo and conditioner. You can have your own fruity, floral or woodsy scent by simply combining these everyday beauty products and at these prices you can afford to experiment! Herbal Essences products are available at CVS nationwide.